Please find here some of our latest news items, including SRDC press releases. Please permit us to respond to a Letter to the Editor dated 9 Februrary 2019 by Mr. Marlon Johnson, the President of the Rupununi Miner’s Association, in which he claims “There is no mercury pollution of the Rupununi creeks”. It is of grave concern to hear miners denying the pollution of the Rupununi rivers, especially those tributaries that run out of the Marudi area. It is false and misleading for Mr. Johnson to claim that there is no mercury pollution of the creeks in the Rupununi. The destruction is evident as there are several small creeks, like those in other parts of the country, where there is no physical evidence of a water pathway but ONLY large holes and degradation of forest, land, and water. Small-scale mining the world over is closely associated with the destruction of large masses of land and pollution of creeks and rivers. In the South Rupununi, this is no exception. While it is dry season at this time of year now, mining, including the use of mercury, takes place throughout the year, and we challenge Mr Johnson to explain how the Rupununi Miners Association contains mercury-laden craters (ponds) from flowing into the creeks during the rainy season. Maybe Mr. Johnson can also explain what happens to the residue of the mercury-laden so-called ‘Magic Mats’ being used on the crushers. Let’s ask the Rupununi Miners Association to show records of the amount of mercury that is being used in crushers. How are gold extraction methods at Marudi different from those used in other parts of Guyana? We see the same excavators, crushers, and mercury being used. These elements are common across Guyana’s small-scale mining industry. And it is no secret that these have led to the destruction and pollution of our lands, waterways and resources. The SRDC in collaboration with WWF carried out a study in 2017, where hair samples of members of communities surrounding the Marudi mining area were collected and tested for mercury. Parabara community members had the highest levels of mercury in their system, at above the World Health Organization recommended safe level. 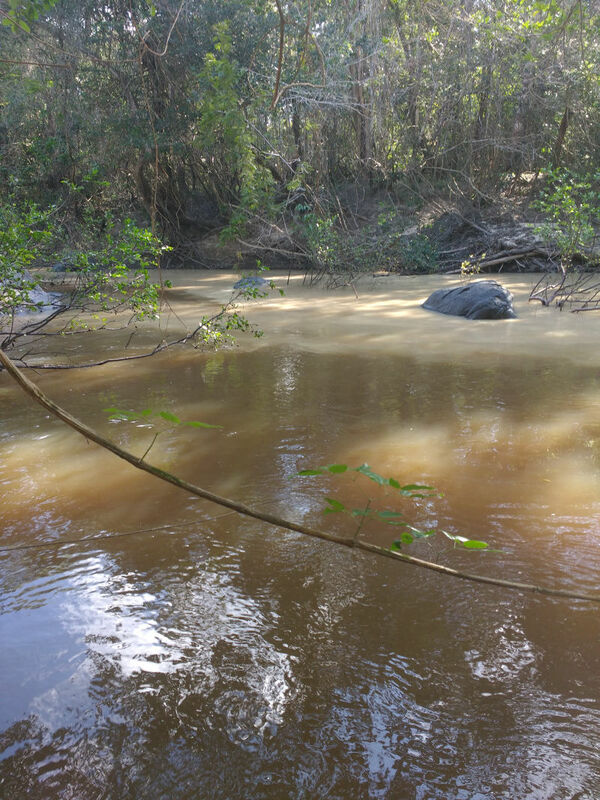 The Marudi Creek, which flows into the Kuyuwini, has been destroyed to the point where there is no defined flow of the creek. The tailings from the mining activity in this area are dumped into the very creeks that then flow in to larger rivers like the Kuyuwini, Kwitaro, and Rewa. These rivers are the fishing grounds for several communities of the South Rupununi. Parabara community members depend on the Kuyuwini River for fish, drinking water and transport to their farms. If the mercury found in our communities is not coming from the pollution coming out of the Marudi mining activities, then where is it coming from? The situation at Marudi is not just of concern to the Wapichan in the South Rupununi, but also to other villages that depend upon the rivers flowing out of the Marudi watershed. Rewa Village, for example, with their thriving tourism business along the Rewa River, is very concerned about the negative impact on tourism should the situation at Marudi continue to be left unregulated. The Rupununi River also provides fish to the Wapichan communities of Karuadarnawa, Aishalton, Awarewanawa, Maruranawa, Katoonarib, Sawariwao, Shulinab, Rupunau and Sand Creek. It also is the bread basket for many Macushi communities in the lower parts of the river. The endangered arapaima is also being managed in the lower part of the river. When one takes a look at the head waters of the Rupununi it is covered with mining claims. Should mining become active in these headwaters, we are looking at the destruction and decimation of fresh, clean and healthy water upon which all the above mentioned communities depend for fish and other means of survival. Although Mr. Johnson claims that there is “almost zero crime rate”, just as in other mining areas, illegal prostitution and drug activity is common at Marudi. Moreover, in just the past month, there have been several alarming incidents. In one case, a miner was set ablaze by another. Another injured miner was air-dashed out of the area after a crusher malfunctioned. Visits by the police into the area looking for criminal elements is a strong indication that such elements seek refuge in places like Marudi. The fact that a few of our community residents sell their produce to miners or work as bag men does not negate the fact that the mining is causing harmful, destructive impacts on this spiritually important mountain and on our environment and lands. It is also false for Mr. Johnson to claim that the majority of those in the mines are Indigenous. All of the operations at Marudi are owned by non-indigenous individuals in Lethem and elsewhere. We welcome steps Mr. Johnson commits the Rupununi Miners Association to take in regards to training its members to ensure compliance with proper mining practices as well as relevant laws. We remain concerned, however, about the lack of effective enforcement and the irregular presence of mines officials at Marudi. We remain adamant that there must be a more comprehensive and holistic way to address the issues at Marudi. We have observed that before mines officers visits, there is a widespread broadcast of such visits, sometime well in advance of the visit, giving miners ample time to get their act together for a few days to present a false impression of their operations when officials visit. In a recent visit, the EPA and GGMC warned the miners that they had no right to mine on Mazoa Mountain in Marudi, but the miners claim that Minister Trotman gave them permission to mine. We also observe that Mr. Johnson discusses meetings that the Rupununi Miners Association has held with the relevant authorities – we have been excluded from most of these meetings. As the primary affected population, the SRDC, representing the Wapichan people of the South Rupununi, objects to the bilateral meetings between the mining interests and the authorities. We demand to be included in such discussions so that we are effectively participating in the decision-making affecting us. There continues to be confusion and contention over an agreement among the small scale miners, Romanex and the communities. The agreement has absolutely nothing for the communities and have relegated them to the roles of bystanders. While Romanex has claimed that the agreement is dead, the Ministry of Natural Resources claim that it is valid. The small scale miners have even approached the Minister and stated in a press release that the Minister gave them permission to access the Mazoa Mountain (within the Romanex concession at Marudi). Both the miners and Romanex company have failed to honour their part of the agreement. In a recent Ministerial outreach, Minister Trotman promised within 2 weeks to bring the miners, Romanex and the communities together to discuss their issues. Those two weeks have long passed by. In the meantime, more excavators have been transported to the Mazoa mountain. Without taking concrete steps to address issues surrounding the Marudi area, the situation will continue escalating and become increasingly complicated and confusing, all the while continuing to cause destruction and damage to our cultural site, our environment, and our traditional livelihoods . It is imperative that the Ministry of Natural Resources, GGMC, and EPA are all on the same page with us with regards to the allowed activities at Marudi and the obligations of miners to protect our environment and our way of life. We call on Minister Trotmon to honour his commitment to deal with these issues and that the Ministry of Natural Resources take a structured, comprehensive and holistic approach to mining issues in the South Rupununi. The South Rupununi is home to some of the last areas in Guyana that can boast healthy, pollution-free creeks and rivers that harbour clean, fresh water supporting Wapichan and Macushi communities and fragile eco-systems. With Guyana promoting a green economy, the Government cannot afford to allow this situation to continue violating our rights to our lands, our way of life, and our environment. Over the past two weeks, miners from Georgetown, Lethem and Brazil have returned to the Marudi Mountain area in the South Rupununi and it is a “a hell hole right now,” according to South Rupununi District Council (SRDC) chairman Nicholas Fredericks. Fredericks told the Sunday Stabroek that he does not know whether or not they have permission to mine. Fredericks, who is also the Chairman of the National Toshaos Council (NTC), explained that just over a year ago, with assistance from the World Wildlife Fund for Nature, residents from four communities Shulinab, Karaudarnau, Aishalton and Para Bara—underwent mercury tests. The results showed that residents from Para Bara village had the highest level of mercury in their systems. “They are contaminated from the mines in Wakadanawa which ows into Kuyuwini River and also from waterways from Marudi Mountain, which ows into Kuyuwini. The water in Kuyuwini is red right now. They have no savannahs around them, so they depend heavily on the creeks for sh. Morning, noon and night, they eat sh. That is why they are so high in mercury intake,” he said. In Region Nine (Upper Essequibo/Upper Takutu), he said, “There are very few creeks and rivers that are not contaminated. Only one waterway in Region Nine, that is, the Rupununi River, is not contaminated by mercury and that is because its source is not in any mining area. In recent months, pollution in the waters had eased up following an agreement signed between miners and the SRDC until certain conditions were met, Fredericks said. The agreement was reached during mediation facilitated by retired Major General Joe Singh. “During that time, through a joint e ort between the Guyana Geology and Mines Commission (GGMC) and the security forces, we got the miners to move out of the area. The pollution had eased a lot,” he said. Fredericks said it does not appear that the GGMC is making an e ort to deal with the situation. At present, he said, the SRDC wants the EPA to revoke the “flawed draft ESIA,” and to conduct another with the full participation of the indigenous peoples who are a affected by the mining, through the free, prior and informed consent process. The Wapichan People of the South Rupununi welcome the recent Communication sent to the Government of Guyana by the United Nations Committee on the Elimination of Racial Discrimination concerning the mining on Marutu Taawa (Marudi Mountain). The UN Committee’s Communication is timely and crucial, as we continue to fight the contamination, pollution, and destruction of our sacred mountain, which is also an important watershed at the source of Guyana’s main waterways. The issue of mining at Marutu Taawa is a matter of grave concern, as it affects our Constitutional rights to health and a healthy environment, as well as to the protection, preservation, and promulgation of our cultural heritage and way of life. The Communication stresses that the UN Committee is concerned that we, the affected people, have not been involved in an effective and meaningful manner in the decision-making surrounding mining at Marutu Taawa. The latest example of our marginalization has been the failure to include our participation and to address our concerns in the draft Environmental and Social Impact Assessment of the Romanex mining project. This is the second time in 2018 that the UN Committee has written to the Government of Guyana, urging it to protect and respect our rights under the International Convention on the Elimination of Racial Discrimination. In the first Communication, the UN Committee had recommended the Government ensure that environmental and social impact assessments of the proposed mining project on Marutu Taawa were conducted with our participation. This did not happen, and we welcome the Committee’s follow-up on this matter. 3. Suspend the mining project on Marutu Taawa until we have given our free, prior, and informed consent to the project following full and adequate consultation.